I am Sundar Subramanian, working as a Design Strategist at Turian Labs. My work involves executing user research driven strategic projects to uncover new product, service or business opportunities or improve existing ones. I strive to champion the synergy of Design Thinking and Strategic Management to envision comprehensive innovation roadmaps for a better future for business and society at large. Why did you choose to be a Design Strategist? I was highly passionate about automobiles during my childhood and I spent a lot of time watching engineering related documentaries and TV shows. Therefore, I developed a keen sense of curiosity and enchantment towards machines, especially cars. After working for 2 years in multiple roles within a large automotive organization, I realized that I was more cognitively attracted towards roles which required a higher degree of creativity and synthesis. Design Strategy was a serendipitous discovery while I was reading an article about IDEO (international design and consulting firm), one of the biggest design consultancies in the world. 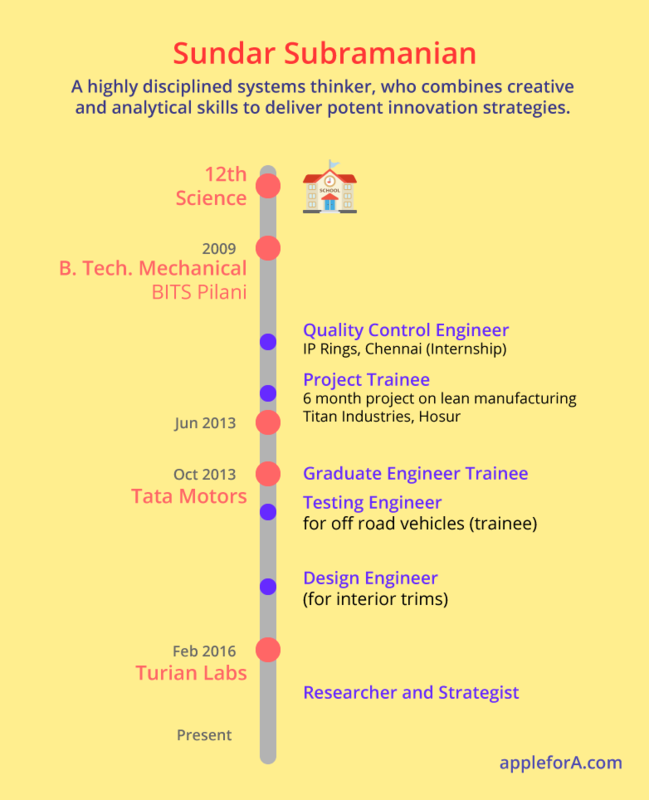 Further on, I made deliberate steps to read more about design thinking, its methods and tools, and later joined a Business and Innovation Consultancy based in Pune called Turian Labs, which paved my way for a career as a Design Strategist. He spent a lot of time watching documentaries and as a result a keen sense of curiosity was developed. When you are young, do explore and be curious. In long run it will help you a lot. Always look out for career options where you can use your skillset to the maximum, don’t just settle down at your first profile as it pays your bills. It may sound silly, but believe me, a book or even a single blog post can change your life. oversee business development and pitching to prospective clients. generate marketing content for the company. In the past, I have been a project manager for consulting projects, wherein I have managed the execution of the various activities involved in a Design Strategy project, from recruitment of users and influencers, to conducting and analysing interviews, synthesizing insights and generating reports. I expressed my keen interest in working in this field and tried to relate the work I could be doing here to the previous work that I had done. I also did a fair share of research on Turian Labs and the past projects they had successfully executed. The only challenge for me have been the mental shift that is required for an analytically trained person to orient to a creative and chaotic environment, where you are constantly challenged to come up with divergent thoughts and ideas, day in and day out. This along with communication of thoughts through a narrative filter have been the key learnings at my job. If you could do it all over again, would you still pursue Mechanical Engineering? I would still choose Mechanical Engineering because that has helped me sharpen the analytical side of my brain, which I feel is also really important to have when it comes to making strategic decisions. Intuition and creative thinking can create momentous impact, but only when monitored with a critical and analytical lens, which my engineering background has provided me. If you pursue Engineering or any degree with a purpose it is all good food for your brain. “Engineering” is just a generic term we misuse a lot. Some students say they ‘love’ Engineering and some say they ‘hate’ Engineering without realising what is involved in it. Understand that at the end it is all about what you can do with the basic education you get at college. What do you love about your current role and what are the challenges? Every single jobs comes with its own pros and cons. There is not even a single career option where it’s all sunshine and rainbows. So choose wisely. Become an innovation/strategic leader at a large/breakthrough organization which is creating/has the potential to impact millions of people. Or start one on my own which can do that. * Sundar is currently in line to pursue his masters degree in Strategic Design and Management from the Parsons School of Design, New York. Coursera’s Online Certification – Design Thinking for Business Innovation at Darden school of business, University of Virginia. All of my past experiences have helped me in one way or another. Learning each aspect of product development and business, whether it be operations, supply chain, design, testing or finance, has added to my overall strengths and has helped me become a well rounded individual. I would consider my experience as a testing engineer the most relevant to my current job, since I had a chance to interact with potential customers and understand their needs and motivations from a product when I used to go on field trials. Every experience in your life has something to offer, you need to look for it and realise it. What are the skills required to be a Design Strategist? Regarding degree, I do not think there is any prerequisites, although I have seen people with background in humanities (psychology, anthropology, social sciences, literature, etc) do very well as researchers. Designers on the other hand really excel when it comes to present the material and making illustrations, whereas Engineers/Business Students are really good at project management and providing analytical inputs. Therefore different people bring different skill sets to the table, which is why many innovation consultancies have a diverse workgroup. What are the various job roles a Design Strategist can perform? What do you think potential recruiters look for in a fresh Design Strategist? The factors. How do I know if a career in Design Thinking is for me? Who do you think should take up this Career choice? Although the title may sound very artsy and attractive, there is a lot of personal and professional rigor that is required to be involved in it. If money is your only goal from a career, being in Design Strategy is definitely not for you. In general, try to practice empathy in everyday life. Be open to people’s mindsets and try to understand things from their standpoint. Start collaborating with like minded people and try to build small ventures. I would suggest to anyone who is interested in deciding their career, to step out and try being in the position they want to be in, within your own company, college or even within your own family. If you want to be a strategist, try strategizing your family vacation plan. Everything we do in life is interconnected since we use the same brain for all of them. Career and personal life cannot be separate. They will get reflected in each other in numerous ways. Stay open, Stay hungry, Keep trying and Embrace failure. Advice to my younger self – Should have taken more risks and failed more often.